Almond is one of my favorite flavorings for desserts, especially during the Christmas season. 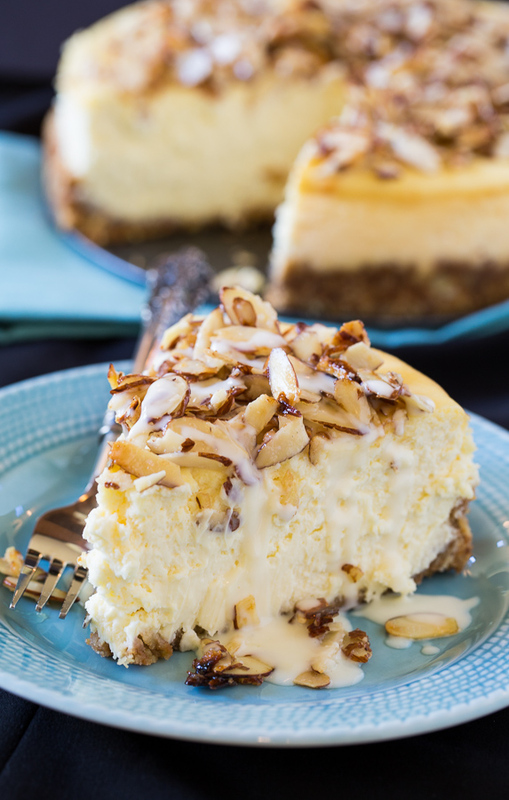 Almond desserts, like this cheesecake and this Almond Cake with Amaretto Filling, seem formal and fancy to me. Turn oven off but leave cheesecake in oven for another 1½ hours to 2 hours. Cheesecake should still have some jiggle in the middle when you shake the pan. To make topping, melt butter in a small skillet. Add almonds and sugar and cook, stirring frequently, until almonds are light brown. Let cool partially (you don’t want to put it on the cheesecake while it is hot, but if they cool too much the almonds will all stick together.) and sprinkle on top of cheesecake.